Now the favorite hand pump is available in a single electric pump!! ISIS iQ UNO� the only handheld with an iQ...an electronic memory that automates and continues your personal pumping rhythm. ISIS iQ UNO� does all the work, yet it feels like your gentle touch. You begin by manually pumping, then ISIS iQ UNO� learns and automates your personal pumping rhythm. Enjoy the precise comfort of advanced ISIS iQ technology... in a mini-sized pump! ISIS iQ UNO� is the first of its kind: a high- performance handheld electronic breast pump that learns from you. The soft Let-down Massage Cushion� gently stimulates the area around your breast, working quickly and naturally. 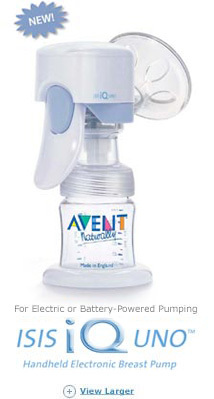 The massage is combined with an effective vacuum that maintains the same consistent vacuum as breastfeeding and draws the milk gently, yet effectively from your breast. You enjoy infinite variable control over suction, speed and rhythm, so pumping feels precisely comfortable. ISIS iQ UNO� is effective, gentle and designed to be totally portable: the mini, ultra quiet motor weighs approximately 6 ounces. You can use it as an electric or battery-powered pump. 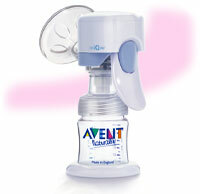 If needed, you can easily convert it into the manual ISIS Breast Pump. 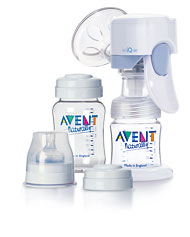 Plus, ISIS iQ UNO� is designed with extra conveniences that make pumping easier on you. The Patented Battery Booster ensures that you get maximum pumping performance, and pumping is uninterrupted even when batteries are low. The Battery Reserve Indicator flashes when there is enough battery power for approximately one more pumping session. The Isis IQ can cycle at more variable speeds than any other pump on the market. Because it is controlled by your programming, you can go as slow as 20 times per minute to hold the breast longer during the let down reflex and as fast 160 times or greater to elicit the let down. All breastpumps purchased with MFTH include a free 20 minute phone or email 'Lactation Consult' from a board certified lactation consultant if needed. Product support is available at anytime.